At the top of the screen, we need to create some tiles which disappear when they are hit by the ball. The ball should also bounce off the tiles. 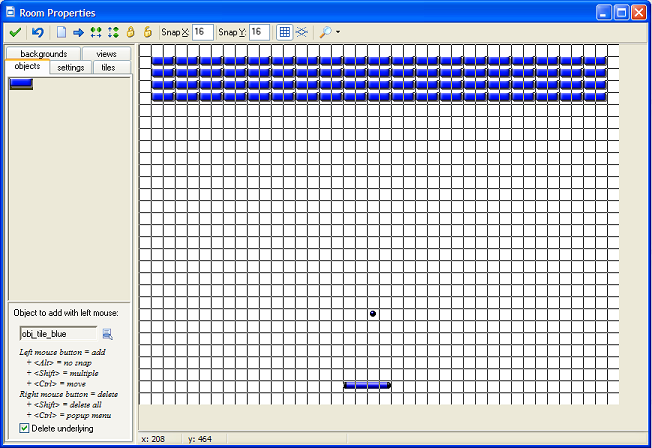 Create a new sprite called spr_tile_blue and load the blue-coloured tile graphic from the sprites folder. 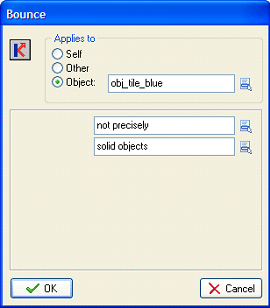 Create an object using this sprite and call the object, obj_tile_blue. Make sure that the checkbox marked Solid is checked. Add a Collision Event to the new object. The collision should be with the ball object. 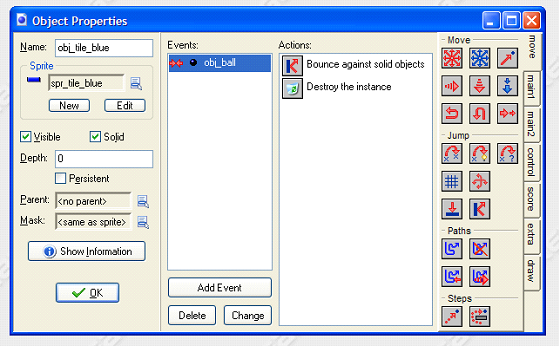 Drag in a Bounce action from the Move tab. Fill it in as shown so that the ball bounces off the tile. Add about 4 rows of tiles to the room. Leave a gap of two squares at the top, left and right edges of the room. Save your work and test the game.